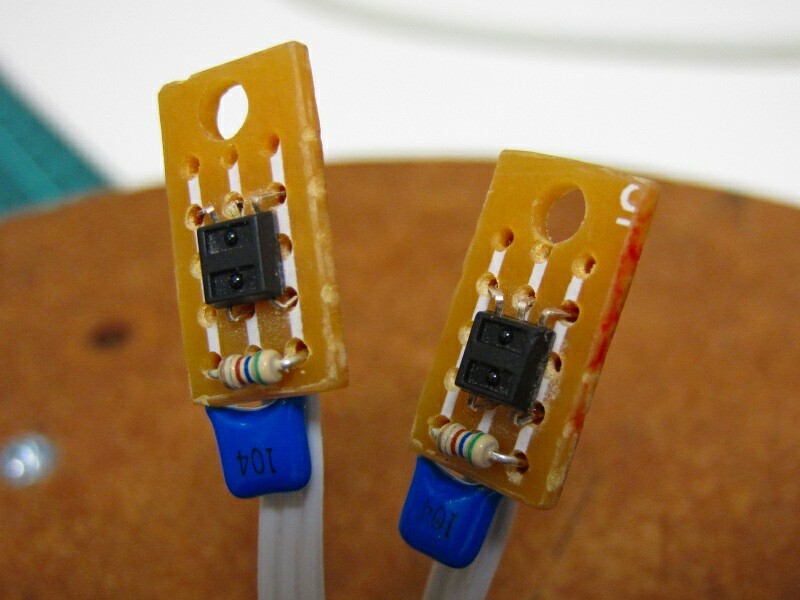 The wheel encoders are made from scraps of proto board and are based on Hamamatsu P5587 digital photoreflectors. The only other components needed are a 0.1uF glitch filter capacitor and a 680R current limiting resistor for the infrared diode. 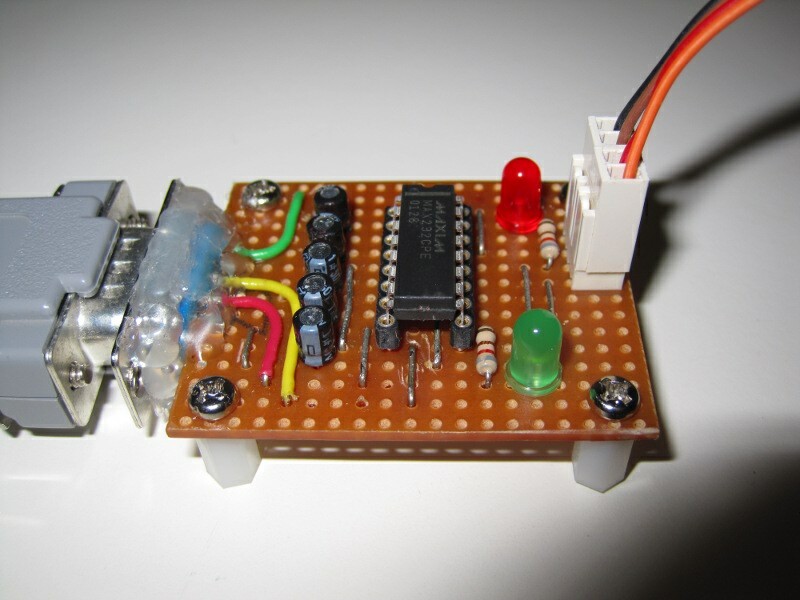 (The photoreflectors are powered directly by the microcontroller's Port C pins 0 and 5. With this value of resistor they draw less than 6mA which is well within the limit of 25mA per GPIO pin of the PIC18F2620.) 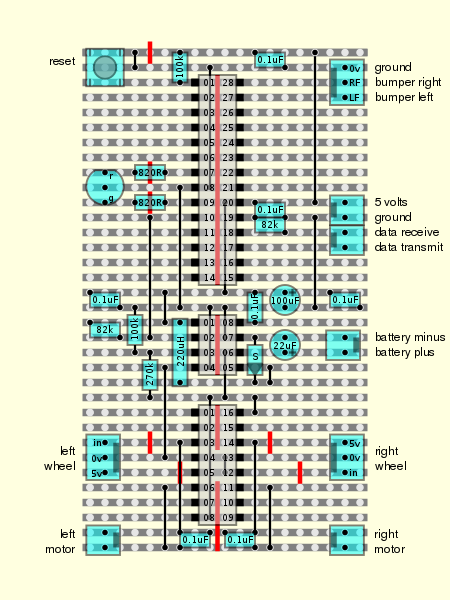 Normally a pull-up resistor would also be required on the output but in this case it is connected to the microcontroller's Port B which has internal pull-up resistors. 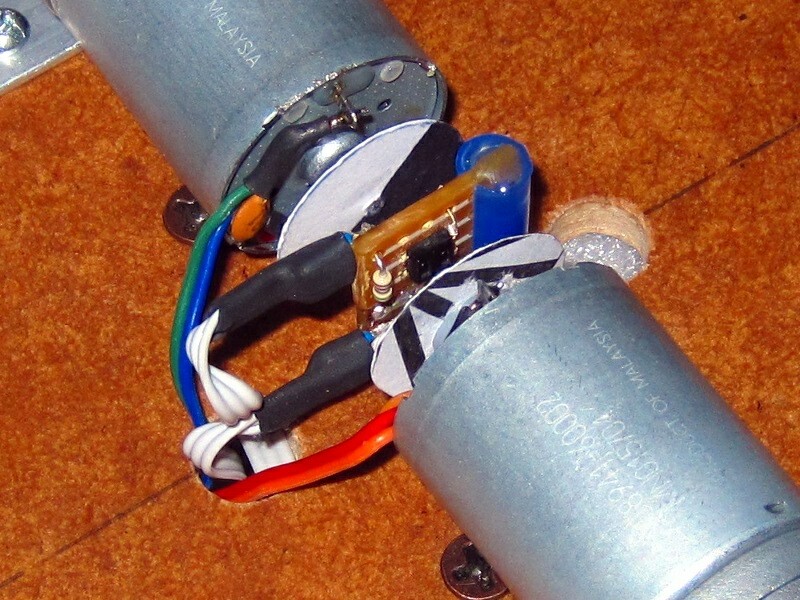 The wheel encoders are protected with a small piece of heat shrink tubing and super-glued together along one side, facing in opposite directions. 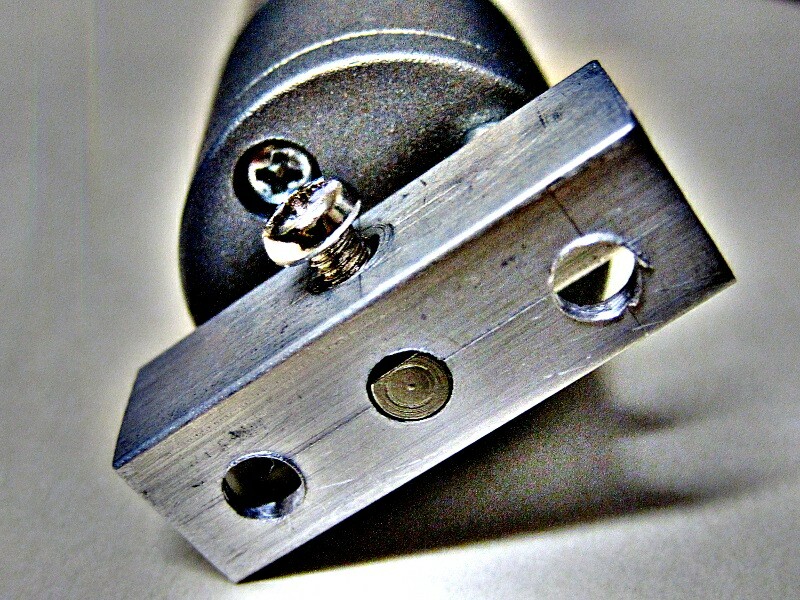 They are held in place between the encoder discs using a short length of stiff plastic tube cut from the ink reservoir of an empty disposable pen. This is set into a hole in the robot base and slit down one side to grip the edges of the wheel encoders. Some hot melt glue keeps it all in place. The encoder discs are cut from stiff card and half blacked out with a sharpie. They are mounted on the end of the motor shafts using nylon rollers from curtain hangers for reinforcement, and more hot glue. These will probably just be temporary as I intend to replace them with discs cut from the lid of a margerine container. This kind of stiff white plastic is very thin and highly reflective making it ideal for this application. 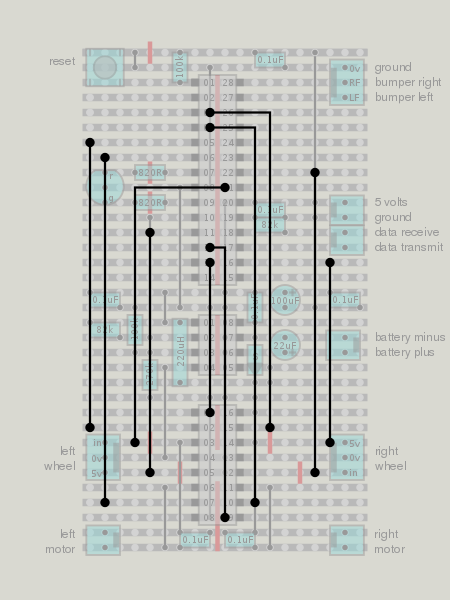 This is the layout for a small robot controller which I designed and built a few years ago. The robot that I designed it for wasn't terribly satisfactory, being too small and unstable, so I've built a new and larger one to carry it. 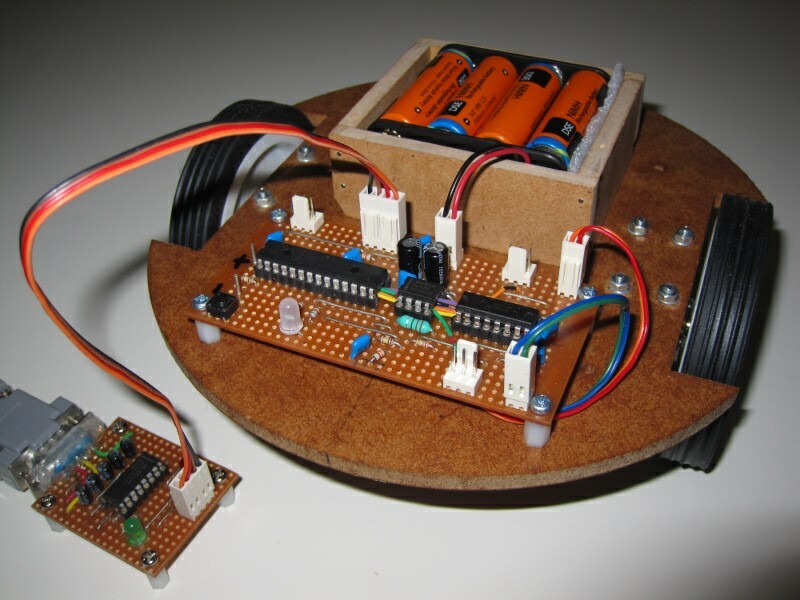 The controller uses a PIC18F2620 microcontroller and a SN754410 motor driver. Power is regulated by a MAX638 switching regulator. It still has five uncommitted general purpose I/O pins available, and the pins for connecting to an I2C two wire bus haven't been connected to anything yet either. The PIC18F2620 has six general purpose input/output pins connected to the SN754410 which is used as a dual full-H motor driver. Port A pins 1 and 2 control the direction of the right motor and Port A pins 3 and 4 control the direction of the left motor. Port C pins 1 and 2 enable or disable the left and right motor drivers respectively. Internally pins 1 and 2 of Port C are controlled using the CCP (Capture/Compare/PWM) modules of the controller which are configured for pulse width modulation. 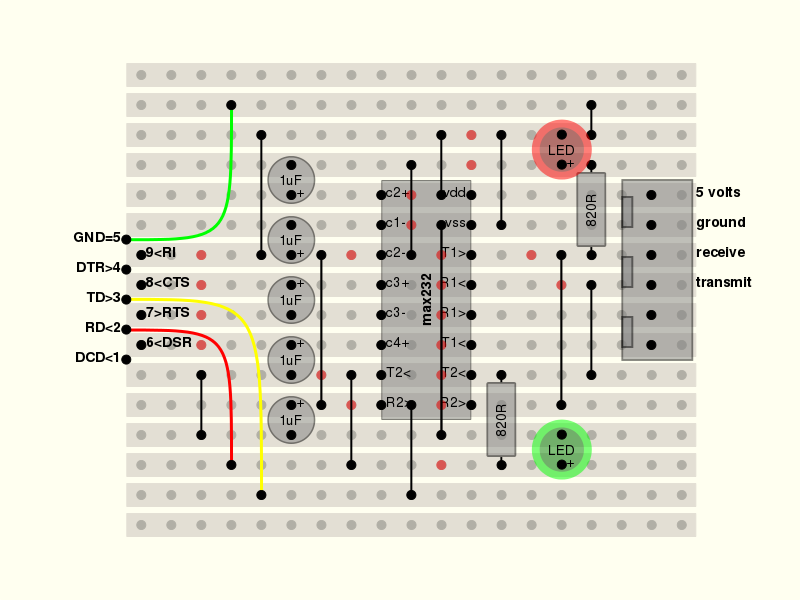 The remaining pins of Port C are reserved for the I2C bus and serial communications. Port A pins 5 and 7 are used as digital outputs to control the red and green LEDs and pin 6 is connected as a digital input to the low battery indicator of the MAX638 switching regulator. The internal pull up resistors of Port B are enabled and pins 6 and 7 are (to be) connected to bumper switches while pins 0 and 1 are connected to the outputs of the wheel sensors. Pins 0 and 5 of Port C are used to power the wheel sensors. The MAX638 has a battery level sensor which triggers the low battery indicator when the voltage on pin 2 falls before 1.31 volts. The datasheet gives the formula R1=R2*(VLB/1.31-1) for calculating the values to use. Alternatively, the formula for low battery voltage given the values of R1 and R2 is VLB=1.31*(R1/R2+1). For the currently installed values of R1=675k and R2=97k this gives a low voltage threshold of 10.43 volts. With a pack of eight 1.2 volt NiMH AA batteries this may prove to be a bit conservative, given that fully charged they only yield 11 volts. Since an RS232 interface is still the easiest way to connect a computer to a microcontroller or robot, I designed a small general purpose interface board around the MAX232 that I could use for this purpose. On one side it has a female DB9 connector and on the other side it has a pair of male two pin polarised connectors which carry TD, RD and ground to the microcontroller, and receive 5 volts from the microcontroller's power supply. This is the RS232 Interface board that I made for connecting my Linux workstation to a robot controller. The red indicator LED shows the status of the TD signal (data received from the computer) and the green indicator LED shows the status of the RD signal (data transmitted to the computer). There is plenty of room to connect either the RTS and CTS signals, or the DTR and DSR signals should they be needed in the future. The interface board connected to the controller of the minirover which I have been constructing lately. The controller has a PIC18F2620 which has been initialised with a bootloader that I wrote in C and compiled with SDCC. The bootloader is very similar to the "official" bootloader from Microchip. I've also written a C program for Linux for uploading firmware to the microcontroller using the bootloader. The first thing that I am going to need to make this site really useful for my robotics experiments is a list of all the web sites that I use on a regular basis (bold text), or that I think I might need to use in future (plain text). As you can imagine these lists can't possibly be exhaustive, but I will try to keep them up to date. If you know of any robotics sites that I've missed, please let me know and I'll be happy to add them. I just bought a pair of gear motors from Virtual Village on eBay and I am very pleased with them. Not only were they inexpensive but when they arrived yesterday they also turned out to be of high quality. However I still need to find a way to couple the D-shaft outputs of the gear motors to a robot drive train and after some searching, the only commercially available option appears to be relatively expensive. 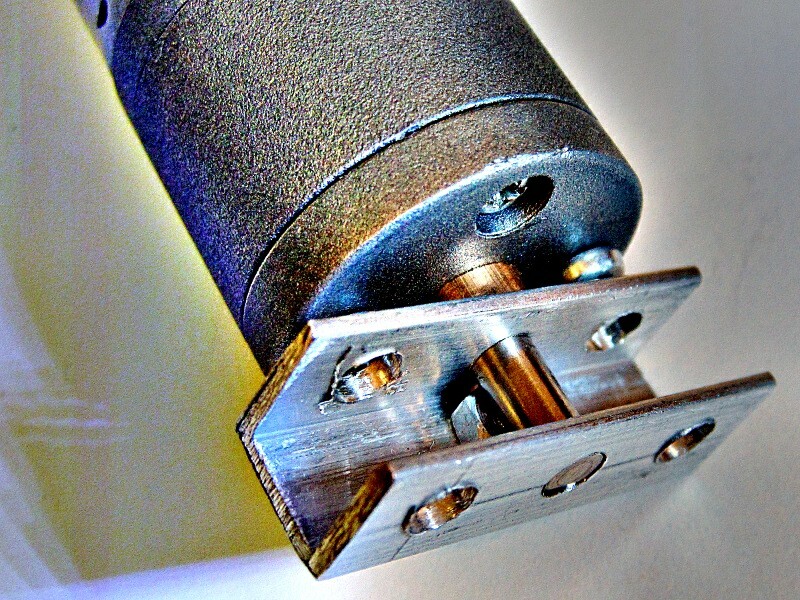 I ordered two pairs of Pololu 4mm universal aluminium mounting hubs from Robot Gear and now await their arrival. Having just spent as much for the wheel mounts as I had spent for the gear motors themselves, it occurred to me that maybe I should ask the experts on the Freenode IRC #robotics channel. It turns out that rue_mohr published a tutorial on how to make your own wheel mounts and after taking a look at that I had another idea. Using a piece of left over 10mm aluminium U-channel from my junk box, and an M3 nut and screw, I was able to avoid having to do any metal bending or thread cutting. These photos are just of a rough prototype... for the final version I will probably have to trim some corners off to make sure there is enough clearance between the body of the gearbox and the wheel mounting. After many years of just thinking about it I've finally started a website dedicated to robotics (this one). There are already many useful and entertaining robotics websites on the net and it is not my intention to create yet another one. Instead, I am going use this website to gather all the information that I find useful and interesting, and also to report on my own robotics activities, such as they are. My motivation for doing this is that there is so much information available on the internet concerning robotics that it is becoming increasingly difficult to keep track of it all. By collecting and organising that which I find relevant to my projects here, I hope to be able to make better sense of it. By publishing what amounts to my lab notebook on the internet, maybe it will also help and encourage some other aspiring roboticists too. Previously I've been publishing a little bit about what I've done on my home page but the format didn't lend itself to frequent updates and it has been sorely neglected in recent years. Over time I expect to update that material and migrate it to this site.